A new report from the Department of Defense Office of Inspector General (DoD IG) exposes even more fraud, waste and/or corruption in America’s ongoing war in Afghanistan. This latest report reveals that more than $3.1 billion of U.S. taxpayer funds provided to the Afghan Armed Forces from 2014 through 2017 was grossly mismanaged. According to the DoD IG, U.S. military leaders overseeing operations in Afghanistan "failed to accurately record" some 95,000 vehicles transferred to Afghan Armed Forces, along with fuel expenses and maintenance costs to keep the vehicles operational. 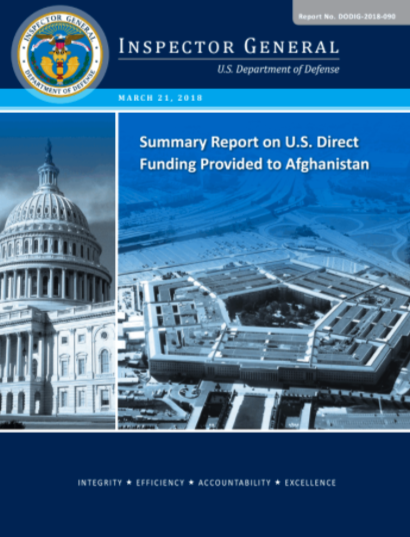 The report issued last Wednesday was the last in a series of DoD IG audits that examined the Pentagon for “systemic challenges” in how senior officials oversee U.S. direct funding to the Afghan Armed Forces said the Military Times. The DoD IG warned the lack of accountability via military leaders overseeing Afghanistan leaves U.S. taxpayer funds vulnerable to "fraud, waste, and abuse." “Combined Security Transition Command–Afghanistan (CSTC-A) officials did not effectively manage and oversee the U.S. direct funding provided to the Ministries of Defense and Interior, which oversee Afghanistan’s Army and National Police, respectively,” the report stated. Stars and Stripes, an American military newspaper, said military officials blame, what else, “inadequate staffing and security concerns” for any financial discrepancies. However, the DoD IG audit determined systemic issues are to blame. CSTC-A officials established unrealistic and unattainable goals for the Afghans to improve their own capabilities toward achieving independence in supplying their own troops, the IG also found. Instead, the Afghan government has remained reliant on the United States to furnish its supplies because American officials have not provided adequate training, according to the report. Additionally, the report stated CSTC-A officials have not enforced penalties within U.S. agreements with the Afghan government. Penalties include levying fines when terms and conditions of contracts are not met, such as providing detailed logs of vehicle maintenance and fuel consumption data. For example, Afghan officials only provided CSTC-A fuel consumption reports for the Afghan army when directly requested by the United States, though contracts require biweekly reports. The IG concluded the United States cannot be certain that at least $174 million worth of fuel was properly used. CSTC-A also cannot properly track the status of some 95,000 vehicles that the United States has given the Afghans because officials did not properly inventory the types and quantities of vehicles provided. Furthermore, the IG blamed CSTC-A officials for failing to properly train the Afghans to maintain those vehicles, leaving the U.S. military to spend about $21 million to replace engines and transmissions that should have been the Afghans responsibility. The IG report was the eighth and final report in a series of oversight investigations into CSTC-A functions since 2015. The reports have uncovered widespread issues within the command, including the commands’ inability to account for more than $700 million of ammunition provided to the Afghan security forces between 2015 and 2017. In other words, just over $3 billion may have been stolen. And lastly, we will leave you with David Stockman, the former Director of the Office of Management and Budget under President Ronald Reagan, who recently appeared on Fox Business — calling out Trump’s record-setting defense spending for fiscal year 2018/19 as absolutely “crazy.” To that, all we can add is that with all the “fraud, waste, and abuse” via the Pentagon in America’s endless wars, the next war would leave the country even more insolvent than it is already.